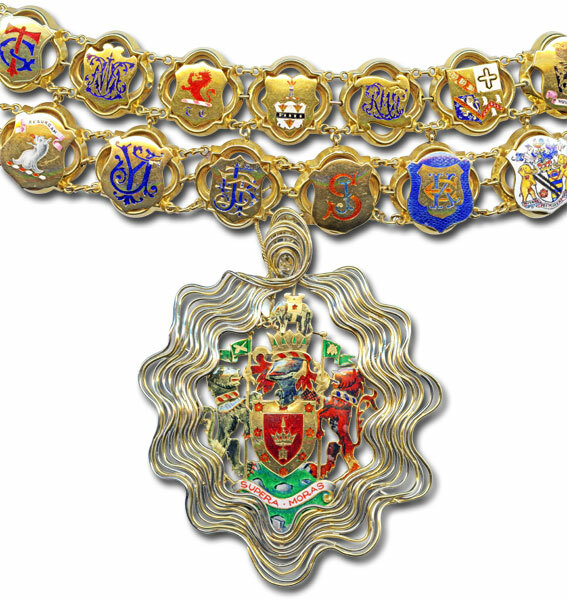 The insignia for the Mayor's Office includes the Mace, the Mayor and Mayoress's chains of office, the Bolton Mayoral Jewel and the Boroughreeve staff. The chains and badges are in daily use by the Mayor, Mayoress/Consort and Deputy Mayor. Other items are on display in a special showcase in the Mayor's Parlour. 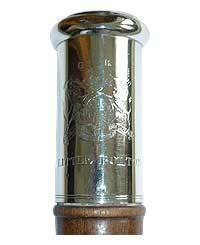 There are also many other items of civic silver and plate within the Town Hall. 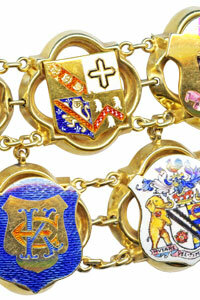 The Mayoral Chain consists of 72 unique gold links and a pendant badge. 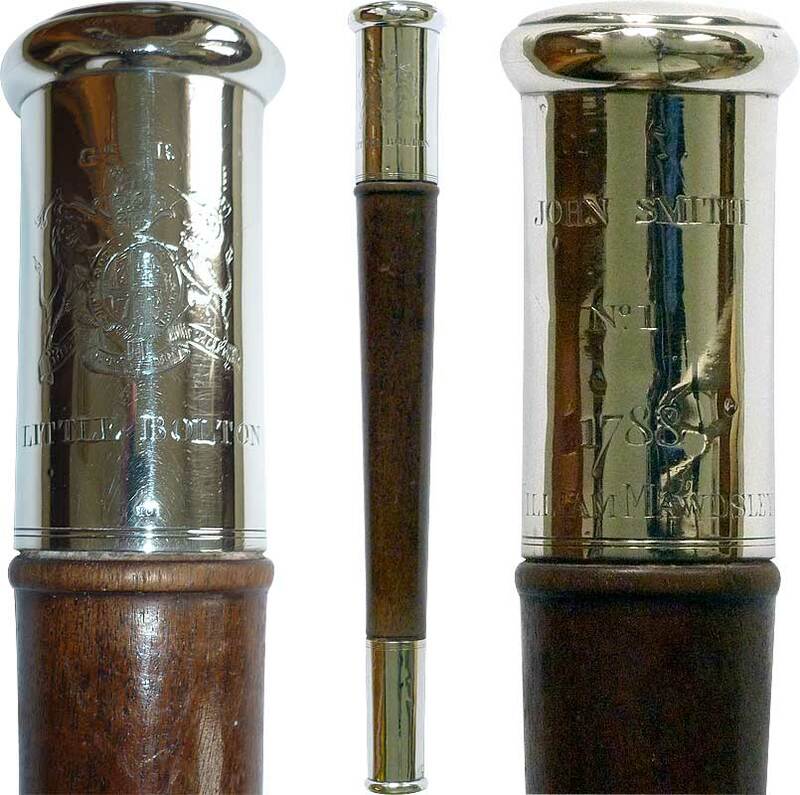 The original inner circle of 36 links was commissioned and purchased by a group of local gentry and presented to the then Mayor, Thomas Lever Rushton, at a Council meeting on 14 August 1850 by Thomas Ridgway Bridson and Mr R S Barlow. It was reported to have cost £90 while the Seal attached to it (see below) was an additional £50. The outer circle, added in 1873, cost £199. The expense was borne by a subscription of the then Council members. The links in the outer circle are slightly larger than those in the original circle. 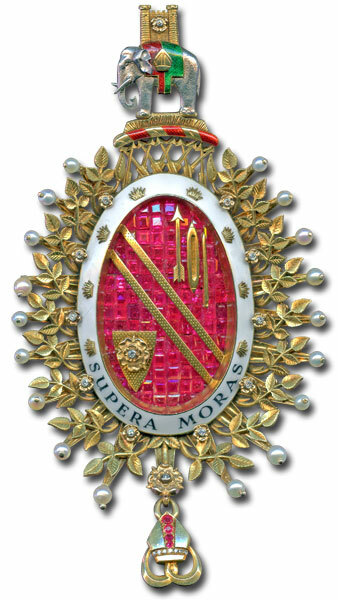 Each succeeding Mayor paid for the insertion of a new link (mostly in the form of a shield), bearing an enamelled coat of arms, crest or monogram. 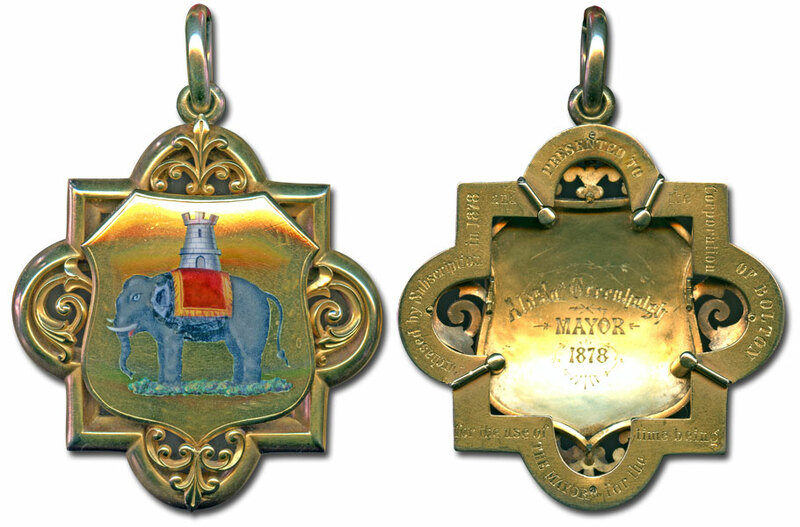 The name and dates of office of each Mayor are engraved on the reverse of each link. Originally a link could be added for each year of office - for example, a Mayor who served two years may have had two separate links. By 1877 it was recommended that in future only one link should be allocated to each Mayor. By 1932 the links on both circles had all been filled and the duplicates were finally removed to allow new additions - including one for Thomas Gregson, Mayor of Bolton 1843-44, who had declined to allow his Mayoralty to be recorded on the Chain. The practice of adding links was suspended for the duration of the Second World War after James Entwistle in 1938. The final two links - added belatedly to the Chain in the 1950s - were for Charles Harold Beswick, 1939-40 and Walter Wharton Tong, 1940-41. Images of each link can be found on the pages of individual Mayors of Bolton from 1838 to 1941. Only 71 of the 72 links represent past Mayors of Bolton - the other one marks the presentation of the Chain itself. 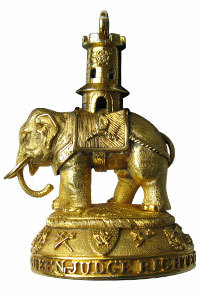 The front of the presentation link shows an Elephant and Castle. "Purchased by Subscription in 1850 & Presented to the Corporation OF BOLTON as a Chain for the MAYOR for the time being"
"Honour the Queen - Judge Righteously - Fear God"
This is a reference to the Mayor of Bolton also being Chief Magistrate at that period. "BOROUGH OF BOLTON MAYORS SEAL"
Although an undeniably impressive object, the seal proved somewhat difficult to wear in everyday use and this eventually led to it being replaced by a simpler but more practical badge. 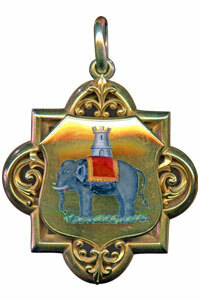 In 1878 a flat gold badge, bearing the Elephant and Castle crest in coloured enamel, was introduced. It was originally intended to be worn separately on less formal occasions where the full chain and gold elephant would have been too cumbersome. 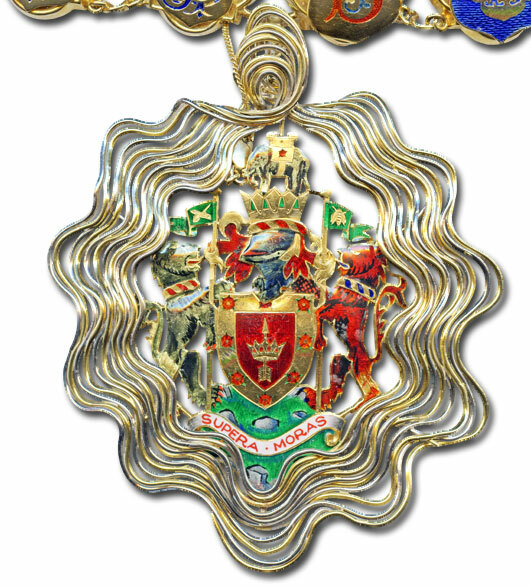 It eventually came to be worn as the main badge of office with the full chain. The new badge was presented to James Greenhalgh who was Mayor at the time. "Purchased by subscription in 1878 and PRESENTED TO the Corporation OF BOLTON for the use of the Mayor for the time being. Ald. Ja. Greenhalgh MAYOR 1878"
The 1878 badge was brought back into use in 2007 by Councillor Robert Ronson as Consort to his wife, Barbara Ronson, Mayor of Bolton 2007-2008. 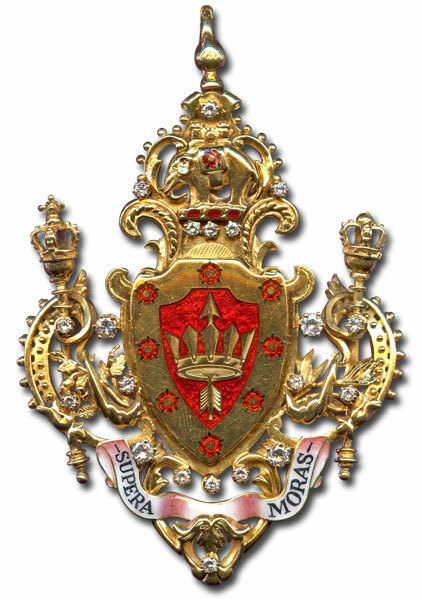 In 1890 official Arms were granted to the County Borough for the first time and in 1902 a new, ornately enamelled badge was adopted. 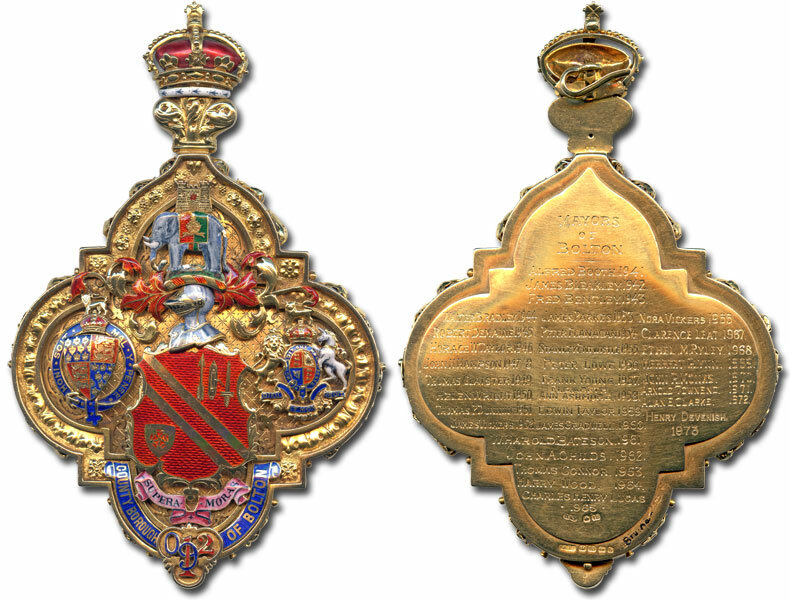 "This badge purchased by the Corporation in commemoration of the coronation of His Majesty King Edward VII, 26th June, 1902. John Miles, J.P., Mayor." The original solid gold back plate of the 1902 badge was reported as having been lost in Moss Bank Park, Bolton on Saturday 26 July 1943 (presumably during the annual "Holidays at Home" entertainments held in the park during the War) whilst being worn by the then Mayor, Fred Bentley. The replacement back plate was fitted in the 1950s and is inscribed with a list of the names and dates of the Mayors of Bolton from Alfred Booth in 1941 to Henry Devenish in 1974. The badge is now used by the Deputy Mayor of Bolton. At local government re-organization in 1974, new Arms were granted to the expanded Metropolitan Borough. 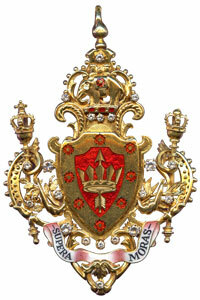 On 16 April 1975 a new badge incorporating the new Arms was presented to the then Mayor, Doris Berry, by Marcus Tillotson, a local benefactor, replacing the 1902 badge. "PRESENTED BY MARCUS E. TILLOTSON 1975"
The Bolton Mayoral Jewel was presented to the then Mayor, Stanley Entwistle, by James W Wigglesworth on 22 March 1956. It is intended for evening wear and contains 124 rubies, 18 pearls and 20 diamonds. The Jewel measures 5" x 25/8", weighs 5.25 oz. troy weight and is red, green, yellow and white 18 carat gold. 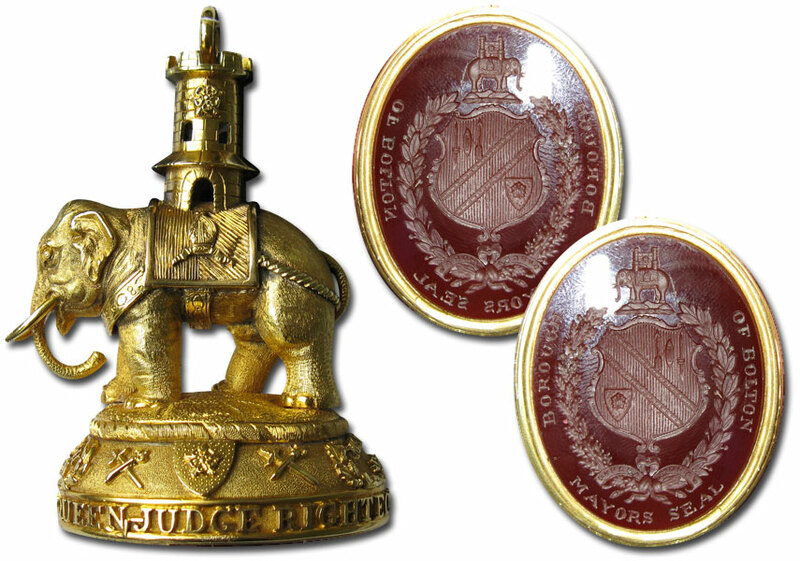 "This Mayoral Jewel was commissioned by Bolton Corporation to give effect to a public Benefaction by James W. Wigglesworth Esquire of Bolton and was first worn by Alderman Stanley Entwistle, JP, Mayor of Bolton on 22nd March, 1956. The designer was Eric G. Clements and the makers Padgett and Braham Ltd. of London." The Mayoress's Chain is of 18 carat gold and was presented on 9 May 1895 to Coralie Dobson, the wife of the then Mayor, Benjamin Alfred Dobson and she was therefore the first Mayoress to wear the chain. The Chain consists partly of gold and enamel Lancashire roses and 16 wrought open quatrefoil links, surmounted by dainty civic crowns. 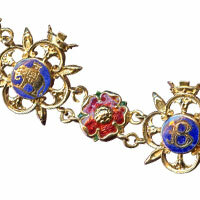 The links have alternate centres of the letter 'B' and the Elephant and Castle in gold against a blue enamel. 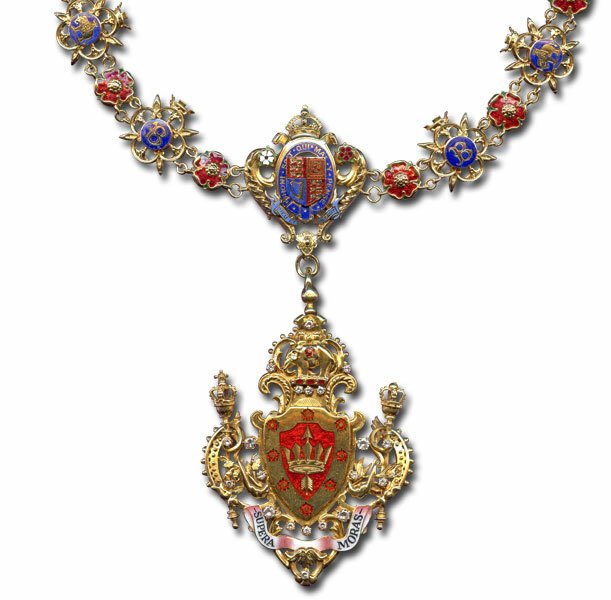 The centre link of the Chain contains the Royal Arms of England surmounted by the Imperial Crown with red and white roses. 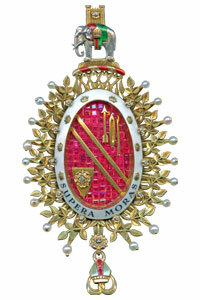 Suspended from the Chain is a gold and jewelled badge containing two maces and 20 diamonds. 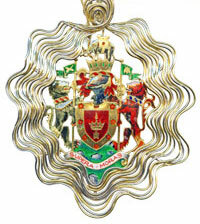 The 1895 badge featured the shield from the original Corporation arms at its centre. 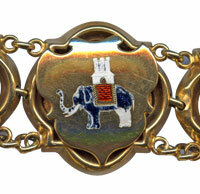 "This chain and badge was purchased by subscription and presented to the Corporation of Bolton. For the use of the Mayoress for the time being. Benjamin Alfred Dobson, Mayor, 1895." The badge was replaced after 1974 with a very similar design but using the shield from the current Metropolitan Borough Arms. 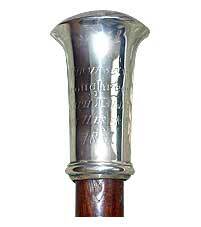 The Boroughreeve staff for Little Bolton, 1788, is engraved with the words "Little Bolton" below the arms of King George III and is about the same size as an old police truncheon or baton. "John Smith - No. 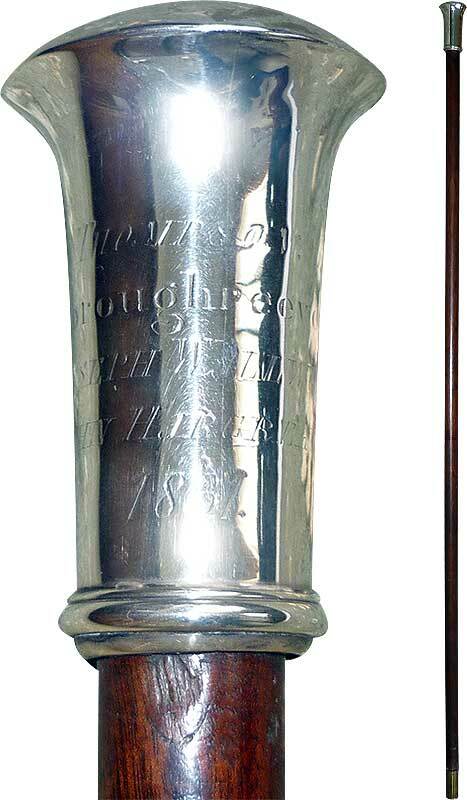 1 - 1788 - William Mawdsley"
"Thomas Thompson, Boroughreeve – Mr. Joseph Wallwork, Mr. John Hargreaves, Constables 1831"
Unlike the 1778 version, the staff is as tall as a man and would have been a rather more visible symbol of the bearer's authority. Bolton's first ceremonial Mace was commissioned by Edinburgh-born Gilbert James French, a prosperous Bolton draper and 'Manufacturer of Church Furnitures'. He was also an antiquary and keen local historian who wrote the popular biography "The Life and Times of Samuel Crompton". 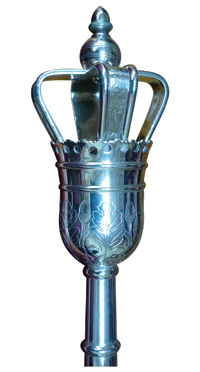 The head of the Mace takes the form of an open arched crown, charged with acorns and oak leaves. It wouldn't be entirely accurate to say that it was presented to the Corporation. French was an invalid, confined to his house for the last few years of his life (he died in May 1866) and the Mace was delivered as an unsolicited and unannounced gift (along with a covering letter) to a bemused but very pleasantly surprised meeting of the Council on 30 October 1865. After 27 years it had apparently never occurred to anyone else that the borough might need a Mace. To their credit (after they had calmed down a little) the members voted that the Mayor should visit Mr French at home to express the gratitude of the Council in person, which he did. 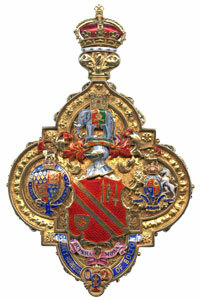 The 1890 Bolton County Borough arms appear in enamel on opposite sides of the Mace, along with the Lancashire rose. "Presented to the Corporation of Bolton by Robert Fairhurst JP, to mark the opening of the second Elizabethan Reign, 4th September 1952". It was accepted on behalf of the borough by the then Mayor of Bolton, James Vickers. 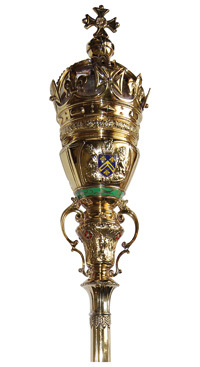 A gift from the nieces and nephews of Alfred Topp, the beautiful gilded Mace of the Borough of Farnworth has an ornate, velvet lined regal crown as its head and features the old Farnworth Borough arms, the Royal arms and Lancashire roses in enamel. The base is encircled by a relief design of flying hornets, echoing those in the Borough arms which represent the paper making industry in the town.